Back by popular demand!! Scarecrow Festival and Open Gardens – Sunday 25th June at 12 – 5 pm. Please reserve the date in your diaries, it promises to be a great day! Huge numbers of scarecrows are waiting to descend upon our little village this summer! Come along to meet the scarecrows, view the open gardens, stop for tea and cake in the churchyard, and talk a load of old turnip to our very own Worzel Gummidge (who will be found wandering round the village somewhere). Great day out for the family! Main event from 12 noon ’til 5pm, with a separate event for local folk in the evening. 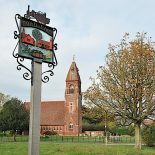 Funds to be raised jointly for Ford End Village Hall and The Friends of Gt Waltham & Ford End Churches. When we put on the first scarecrow festival in 2014, we had some absolutely brilliant scarecrows on display–they were amazing! If you’re in Ford End, and would be interested in taking part, please let Sandra Brown know.